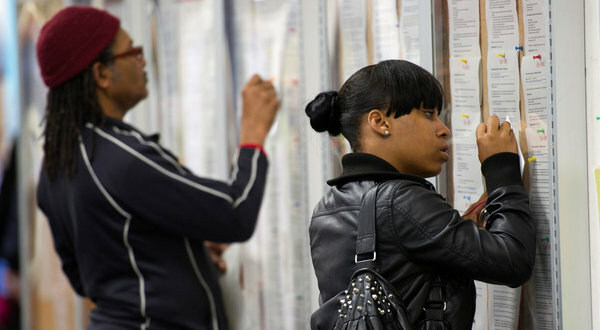 Job seekers looked at listings on a bulletin board at the One Stop Career Link Center in San Francisco in August. The nation’s lingering unemployment crisis has forced many people without work to dip into their savings, borrow from relatives and do without necessities including health insurance, and most people who receive unemployment benefits said that the money was not enough to meet their basic needs, according to a New York Times/CBS News poll of jobless Americans. Still, despite enduring hardships and being even more pessimistic about the nation’s economy than the general public, unemployed Americans remained optimistic about eventually landing jobs. A little more than half of those polled said they were either very or somewhat confident they would find long-term employment in the next year, and a majority said they expected that when they did find permanent work, it would be at a similar or higher salary than they had received in the past. But the poll found deep unease about unemployment benefits. At a moment when several states have decided to pay fewer weeks of benefits to save money, and President Obama has been urging Republicans in Congress to renew a program — due to lapse at the end of the year — that pays federal jobless benefits to the long-term unemployed, 7 in 10 of those receiving unemployment benefits said that they feared their benefits would run out before they could find new jobs. While jobless benefits have been criticized as unaffordable by some Republicans, particularly at the state level, three-quarters of the people receiving them said that they got “a lot less” than they used to earn at their jobs, and two-thirds said that the benefits were not enough to pay for basics like housing and food. “I was earning $50,000 a year, and now I get $200 a week,” said Jan Thomas, 62, an unemployed marketing executive from Sarasota, Fla., who has been laid off from two jobs in the last three years. Ms. Thomas said in a follow-up interview to the poll that she recently dropped her health insurance “just hoping all will be well” and that she would soon lose her unemployment benefits, leading her to think about applying early for Social Security. “And I’m giving up my apartment and moving in with my mom because my unemployment will be running out,” she said. The toll that unemployment is taking on families is not just financial, according to the telephone poll, which surveyed 445 unemployed adults from Oct. 19 to Oct. 25 and has a margin of sampling error of plus or minus five percentage points. More than half of those polled said that they had experienced emotional or mental health problems like anxiety or depression because of their lack of work, and nearly half said that they had felt embarrassed or ashamed not to have jobs. More than a third said that they had had more conflicts or arguments with family and friends because of being jobless. The top reason people cited for not getting work: Too many applicants. Threats of foreclosure or eviction were reported by a fifth of the unemployed, and one in eight said that they had moved in with relatives or friends. More than half said that they lacked health insurance. A fifth said that they had received food from a nonprofit organization. And in a sign that the nation’s current economic woes could reverberate for years, nearly two-thirds said they would probably not have enough money to live comfortably during retirement. More than half said that they had taken money out of savings or retirement accounts. But the unemployed continue to believe in the American dream. Two-thirds of those surveyed said that they still believed it was possible to start out poor in this country, work hard and become rich — only a little lower than the three-quarters of all Americans who said that they believed that, according to a New York Times/CBS News nationwide poll that was conducted at the same time as the poll of the unemployed adults. Robert Roberson, 52, a licensed plumber from Corpus Christi, Tex., who has been out of work for a year, said that he hoped to get work soon when a delayed project to build a prison breaks ground. “I actually think the job market will get better because I think the recession will have a break and they’ll go back to building housing,” he said. Unemployed people are now less likely to blame former President George W. Bush for the nation’s high unemployment rate than they were two years ago in the last Times/CBS News poll of the unemployed. But few blame Mr. Obama. Eight percent of the unemployed in the new survey said that Mr. Bush was most to blame, down from 26 percent two years ago. Five percent said that Mr. Obama was most to blame, almost the same as the 3 percent who said so two years ago. Nearly a fifth said “politicians” were most to blame. There are currently 14 million Americans unemployed, and more underemployed, and the unemployment rate remained stubbornly high at 9.1 percent last month. Fierce debates over how to spur the economy, and how far to go in taking care of unemployed people, are consuming Washington and state capitals. One of the most contentious policy questions is how long the government should continue to pay unemployment benefits. The length and depth of the downturn led many states to deplete the trust funds they use to pay such benefits, forcing them to borrow billions of dollars from the federal government and prompting some states to raise taxes on businesses to continue paying benefits. This year half a dozen states decided that they would no longer pay the 26 weeks of state benefits that has long been standard. The federal government has been picking up the tab to pay extended benefits that allow some long-term unemployed people to collect checks for up to 99 weeks in states with the worst unemployment problems. If that program is not renewed at the end of the year, 1.8 million people could lose benefits in January, according to the National Employment Law Project, which advocates renewing the program. Seven in 10 of the unemployed said that the government should pay benefits for 99 weeks or more. While a slight majority of Americans said that getting unemployment benefits makes people less motivated to seek work, only 40 percent of unemployed people said that it did, with half saying that it had no effect. Three-quarters of the unemployed said that they were qualified, or overqualified, for the jobs that they were seeking. Four in 10 said that they would consider moving elsewhere to get jobs, but only 15 percent said that they had applied for jobs elsewhere. More than a third said that they had taken classes or trained for new jobs while unemployed. Copyright 2011 The New York Times Company. Reprinted from The New York Times, National, of Thursday, October 27, 2011.